How do we know that the Bible today is true to the original manuscripts which we no longer have? Eric Barger: Well, the Dead Sea Scrolls helped us, because the Dead Sea Scrolls mention every book of the Old Testament except for the book of Esther. Dr. Reagan: Prior to the discovery of the Dead Sea Scrolls, the oldest manuscripts we had of the Old Testament were only a 1,000 years old, so the discovery of the Dead Sea Scrolls catapulted us back another 1,000 years. When comparing the manuscripts, it was discovered that there were not any major differences from the ancient versions to what we have today. Eric Barger: Exactly! That is the stunning thing about being able to compare our manuscripts from those of nearly 2,000 years ago. When they were examined side-by-side, it was obvious that we have the inerrant Word of God today. God has supernaturally protected His own Word. Nathan Jones: Some people seem to treat the Bible as if God can't write a book. Sure, He can make the universe, but He just can't keep a book about Himself together. That attitude shows a lack of trust in God. Wouldn't you say that most of the major criticism of the Bible comes from people who are too scared to trust the Bible as God's Word? Eric Barger: It also lifts up the idea that man knows better than God. I've said so often that no teaching on the earth either scientific or historical is ever placed at the mercy of the Scriptures. And yet, a lot of people out there want to test the Bible by all that man knows. Instead, I think we ought to test everything that man brings up by the Bible. The Bible is the most important book that I will ever learn from. Contained within are the very things I need to know more than anything else. It is what my children and grandchildren and, well, just everyone needs to know more than anything else. When it comes to all of my secular education, the second I breathe my last breath it is finished being of use. But, the Bible — the very Word of God — will last for eternity! So, indeed, what the Bible teaches is the most important thing I will ever know. 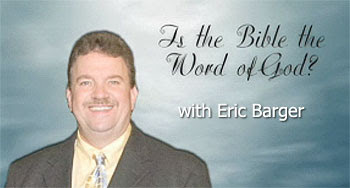 In the next part of this series on the validity of the Bible, we'll ask Eric how we can know that the Bible is really the Word of God. I think it is VERY interesting at the way the scrolls were discovered at the right time to make complete asses out of Westcott and Hort and their Liberal supporters. The Word of God never returns void. HM has requested that all her subjects celebrate with her from all across her realm with Sunday lunch! So either the road will be blocked off, or the tables will be on our front lawn?! I wanted to run for the hills as I really don’t like parties; but my hubby was so crestfallen – what could I do – divorce does seem a mite excessive. 60 years is quite impressive. Here in the States we think 4 is too long. We're already in election fever and it's still over a year away! BYOB? Bring your own bottle/beer? Definitely; and I aint no way, no how, baking for that lot plus US gatecrashers - having said that I reckon 'his nibs' will prob get in a few barrels to have on tap! Don't toast the queen while the music is playing! I had to think hard about that one!